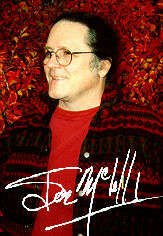 Storyteller, author and teacher, Joe McLellan was born September 27, 1945, in Monterey, California. "Monterey's actually where my mom was from. My dad was an officer in the Marine Corps, and he met my mom before World War II. They got married when he got his only leave during the war. I guess I was conceived on their honeymoon. The war got over just in time for my dad to get back and have my mom, eight months pregnant, greet him. They stayed in Monterey for a while and then moved up to Bend and Madras, Oregon, by the Warm Springs Reserve. My dad was originally from western Oregon, the area around Le Grand, Pendleton and the Umatilla Reserve. Often I spent time with my grandparents, and, through spending that time with them, I think I acculturated a little bit into the Nez Perc� way. Having an aboriginal background and sort of an Irish- Catholic background always brought about great confusions. There's all kinds of contradictions and culture clashes." "After my great-grandmother died, we moved to Wyoming and then to North Dakota. My dad had a job as a professor at North Dakota State University and did a lot of field work around in the farms. He'd take me along on trips all over North Dakota and show me what some of the plants were for. He had a couple of friends in southern North Dakota where we'd stop and sometimes have a sweat. Then, Dad would always say, 'You know, you don't need to tell Father about this.' It's kind of funny because today you can't go into a sweat lodge without tripping over a priest or a minister or a nun, but in those days it was taboo. I grew up with a lot of Irish-Catholic kids, German-Russian kids, Dakota kids, and Ojibway kids, who were called Chippewa in North Dakota. There were quite a few Métis people, but nobody would ever claim their Indian ancestry because, during the 50's, it was sort of, 'If you looked white, you got by.' There was still a lot of racism then." "A few things were important to me growing up. One of them was stories. When I was young, my dad would always tell me stories, and my grandparents and great-grandma always told me both histories of the family and stories, and I'd sort of 'trance-out'. I think a good storyteller puts you in a 'trance,' and I'd go there. When I started school, I already knew how to read a little bit. A lot of things happened in school that I didn't like. It was hard for me to establish my identity, to know who I was, and seeing how Indian kids were treated was hard for me. I was sort of caught in between, the situation of not being respected by either because you're neither." "When I was about nine, I started developing Tourette's Syndrome. It wasn't diagnosed until I was almost 50, but, as a child, I'd have ticks and twitches and a lot of eye-blinks, and I'd make little grunt noises sometimes that bothered people. Teachers told me to 'stop making faces, or to 'sit still and be quiet.' I found that books were magic. They'd take me somewhere where I didn't have to deal with what was going on because it wasn't always pleasant. I found that I was much happier reading than anything else. In grades four and eight though, I met teachers who made me want to be smart and want to learn. They valued who I was and what I did, and I began to see that teachers had some magic too." "Growing up, I wanted to be a magician, and so today I practise magic in the ways I know: by writing books; by telling stories; and by teaching. These are the three 'magics' I've had in my life. I think it's important for me to pass on stories because I remember how important stories were for me. I can also see how the stories I heard, even when I was as young as six, are very valuable to me today, but not valuable in the same way they were then." "In an aboriginal view, a story first appeals to you physically because you get the physical warmth and closeness of the people telling you the story. You pick up how their voice changes when they're telling a story, and, for the rest of your life, your body reacts immediately to a story and opens up. Sometimes when I'm telling stories, there'll be people there in their 30's up through their 80's, sitting there with their mouths wide open and listening with big gleaming eyes just like the little five-year-olds. I can tell that these are people who were told stories when they were little." "Then there's the emotional part of the story. When you get to be about 6-12, you wonder how to behave and act, and stories tell you how. People just didn't go up to kids and say, 'Don't do this' or 'Don't do that.' They'd spot a behaviour and tell you a story, and the child would figure out the meaning from the story. 'If you get too mad, this will happen' or 'If you pick on people, this might happen.'" "Then you have the intellectual facet of the story. You get to be a little bit older, and you're going, 'Oh, that's what that story meant,' or 'That's why my grandpa told me that story.' All of a sudden, people start finding meaning in the stories. Now, there's a point where, if you over-analyze a story, sometimes you take the magic out and break it, and so you have to be careful. I believe that, if you write down a story, it's just waiting there to come back in somebody's breath. I think Terry Tufoya says, 'Stories need to be wet with breath.' Even though I really like my books, the stories are better told." "And then the last part of a story is spiritual. I think you're only in your 40's and 50's before you start realizing that. When people ask me to explain what I mean by 'spiritual,' I say, 'Look at the Bible. A lot of the Bible is stories, and those stories show us our relationship to God. The stories about Nanabosho show us the relationship between people and God, God and nature, and people and nature.' The stories are a basic scripture. When you write them down, you run into the danger that some day people'll be going around, two by two, knocking on your door at seven in the morning and quoting Nanabosho tracts at you. And that's not what the stories are meant for. The story has to be taken holistically, in its whole entity, for its mystery to work on somebody. When you reduce it to one or two quotations, you are missing something." "When you write it down, you're missing something too. There's a difference between the written and the spoken word, and there's a difference in how speaking and writing convey meaning. Much more with the spoken word, the meaning sort of drips in on the tone of voice and the look and the physical aspects of the teller and also the vibrations of the words as they enter someone else's heart because, when we are talking about these stories, we are not talking about them coming into the brain but into the heart. When a story comes into the heart, it's very important to realize it mixes with whatever's there, with whatever the listener brings over the course of his life. I could tell a story to a child, and that story'll go around in their heart for ever. It'll mix with other stories and characters from books and TV and the wisdom their parents and grandparents and other elders have told them. It will mix with the sounds of nature, the birds, the fire, the water, and it'll mix with how one makes up their own tunes that come from the way their heart vibrates with the creation. And when they need that story, it'll come out just like magic. That's why a lot of people, when they're in their 40's and get grandchildren, will suddenly remember what their grandmother told them 40 years before and will remember it better than they could have the day after she originally told them. So those are some things about stories." "I grew up mostly in Fargo, North Dakota. I went to a boarding school, and, like the boarding schools of those days, it was a good place to get physically and emotionally abused. And then dealing with that gives you something to do for the next 20 years. When the war came in Vietnam, I decided in 1967 I'd come to Canada and teach children instead of going to Vietnam and be responsible for killing them. I taught in Melita, Manitoba, and then I worked at the Children's Home of Winnipeg, setting up an educational program. The program was sort of based on Summerhill, but people weren't comfortable with that and said, 'You can't do this. We'll get somebody else to run it.' I said, 'OK' and took a year off and, already having an English and Drama degree from North Dakota State, I went back to the Faculty of Education at the University of Manitoba and got my teaching certificate. I met some wonderful people there and went back with enthusiasm to teaching at Luxton, Machray and Norquay and Aberdeen schools in Winnipeg and then in the Beedabun Junior High School program which we set up for aboriginal street kids. What's funny about Beedabun is that, in 1992, I was given the Hilroy Fellowship Award by the Canadian Teachers' Federation for the Beedabun program as being very innovative. I pulled out what I'd written up back in the Children's Home days, and it was almost the same thing, but now I was a 'hero'. I guess I spent all those years getting credibility." "I've always integrated stories into my classroom, and I learned stories from everywhere. It seems like, if you decide to become a storyteller, stories find you. You can sit down on a train and have a six hour ride ahead of you, and, just by magic, the person sitting next to you has a whole circle of stories they just need to tell. When I was working on the basic research for what became Nanabosho & Kitchie Odjig, there was something that I couldn't quite get straight. I was going to set it aside, and we went down to the Roseau Pow-wow. As I was walking across the fields, I met this old man who said, 'I want to tell you a story about Nanabosho,' and he told me the story of Nanabosho and the Great Fisher. What was interesting was that the one part I was having trouble with became very clear when he told it that day." "When you're a storyteller, you start out looking for stories, and the next thing you know they just drop on you from everywhere. I know a lot of stories from a lot of different cultures. I tell the Nanabosho stories because people, when they told them to me, made me promise to carry them on and tell them to kids. I didn't write them in books until I checked with four different elders who said it would be OK. One of the reasons that the elders thought it was OK to do that was that you used to be able to get all of your relatives into one little room, but now they're scattered all over the place, and children don't see all their relatives. There's Ojibway children in every continent probably except Antarctica. A lot of these kids got adopted out too, and they can't find their way back. Maybe one of these books will find its way into their hands." Becoming an author was not actually Joe's idea. "The Manitoba Department of Education approached me. They had been working with a Winnipeg-based company, Pemmican Publications, and they said, 'We know you know the stories. Would you write them?' Pemmican wanted to do a series of 12 books, and so that's what we're doing." The first two books, The Birth of Nanabosho and Nanabosho Steals Fire, are chronologically the first stories, and Nanabosho's still a child while in the rest he's a grown man. But the aboriginal mind doesn't work like that. These stories come in a circle, and so you can enter the circle anywhere you want as long as you enter it with respect. The Eurocentric mind, however, needs to start at the birth. The most important thing for Indian people is balance whereas for the Eurocentric person maybe the most important thing is order, and order and balance aren't the same things. You can put something in order, and it will be out of balance, and you can have something in balance, and it can look like a nest to somebody that has order. But to someone where balance is important, it's the most beautiful thing they've ever seen.. It's more than looking; it's feeling and the senses come into that." "After the first two books, I didn't want to do things that way anymore, and I thought, 'Nanabosho dances.' I wanted something like that because there weren't any books for a lot of the young kids that get into dancing. The next one was Nanabosho, Soaring Eagle and the Great Sturgeon because I thought there should be some kind of book for kids that's a little bit explicit about ecology. Nanabosho & Kitchie Odjig, which has a tie-in with singing, was going to be the fifth book, but Sesame Street, the TV show, wanted me to tell two stories, and they asked Rhian Brynjolson to illustrate them. One day, Rhian and I looked at each other and said, 'Hey, wait a minute. We've got two stories with pictures. Let's do these now.' And that's why How the Turtle Got Its Shell and Nanabosho and the Woodpecker came next." "Nanabosho's capable of great things. He's part spirit, part Manitou, part man, and he was sent to teach the people. Early on, he found out that you can't tell people anything. They don't listen. You can't tell them to do something, and you can't tell them not to do something, and so he thought, 'If I act real stupid, they'll see that and laugh at it, and they'll remember not to act like that. And if I do the wrong thing, they'll figure it out. If I just do the right thing, they'll just say, 'I can't do that, but you, Nanabosho, you can do because you're a spirit.' What Nanabosho does then is take all of the silly stupid things we do and magnifies them and lays them out there for us to look at." In creating his books, Joe explains, "My books are like sandwiches." And by "sandwich", Joe means that his books always begin in the present with a boy, Billy, and his sister, Winona aka Nonie, going to visit relatives, usually their grandparents. Either the children ask for a story or something in the environment triggers a story from the relative. The story then becomes the sandwich's filling with the other bread slice being the children again back in the present. Joe explains that he deliberately uses this stylistic device because "I didn't want to write just a legend and have a picture of Indian people as they were. If you just have Indian people in the old days, then that perpetuates the myth that Indians were 'then' but are not 'now'." "I purposely wrote parts where we could have children doing things today and pictures of people today, like 'regular' Indian children. When I was little, there were never Indian people in books, except maybe Hiawatha, and then Longfellow had taken Iroquois names and an Ojibway myth and mixed them together. It doesn't help a child's self-image if they just see people like themselves 500 years ago. For that same reason, when I'm telling stories, I have two or three modern stories that I put in for the kids. 'People like themselves' also means today, now, and so in the books we've taken care to be as realistic as we can in both the pictures that illustrate Nanabosho's older times and the children today." Billy and Nonie can be found both on their home reserve and visiting family in the city. While Billy is older than his sister, he is not always the central character in the "bread" portion of the story sandwich. 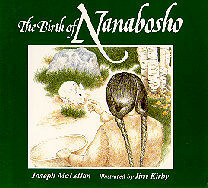 In Nanabosho, Soaring Eagle and the Great Sturgeon, for example, it is Nonie and her city cousin, Bonnie, who go fishing with grandfather while Billy stays home to help with the laundry because his mother thinks "he should learn how because some day he will be on his own and he'll have to do his own laundry." While the text doesn't say anything more about Billy's carrying out the chore, Brynjolson's illustrations of the girls' ice fishing each contain an insert which shows Billy's "progress." This wordless story Joe claims as his idea. "I wanted to sort of bug some sexist little boys." Joe acknowledges that his wife, Matrine, has played an important role in the books he has written. "Ojibway is Matrine's background, and a lot of these stories I owe to her relatives. We talk about the stories and give each other feedback. Matrine always helps me with words here and there. With Nanabosho & Kitchie Odjig, she had quite a bit of creative input, and so I said, 'You're not getting any credit for what you've been doing,' and so she's shown as the co-author on that book. The next one is 'Nanabosho and the Cranberries.' The body of the story is written up, but Matrine and I are still talking about what goes around it. While we have a creative partnership, Matrine prefers that I be the performer. I'm introverted, but I have extraverted behaviours because I've always been a teacher, and so it's easy for me to go tell stories. It's harder for Matrine to tell stories, but she really does tell them better than me because she can tell them in Ojibway." Joe's writing regimen is simple. "I just go by Hemingway's dictum: I wait until I'm inspired. The act of inspiration is the act of attaching the seat of my pants to the seat of my chair. I have to discipline myself to do that, and in the last couple of years I haven't written as much. Getting a new job and having some religious duties to do have cut into my time, but I'm always writing." While Joe's illustrators have always been close at hand, Joe says, 'I'm very careful not to tell them what to do because I don't like people telling me how to write, and I know they wouldn't want people telling them how to draw. If they ask me questions, I'll tell them what I think, but I don't direct them.'" For Joe, the "story" is always central. "I go to different schools and tell stories, and people will warn me, 'This is a hard class.' When I go in and tell the stories, the kids sit and listen perfectly, and then the teachers say, 'That was really great. You held their attention.' But I have to tell them, 'No. It was the story,' because anybody could tell that story and hold the children's attention. People have gifts, and the gifts come from the creator, and we have to use them to put back. The world can go on without me, but it can't go on without stories. When I'm gone, there'll be another storyteller. Part of my job is to tell the stories, but another part of my job is to make other people yearn to be a storyteller. That's why storytelling, writing and teaching all go together." 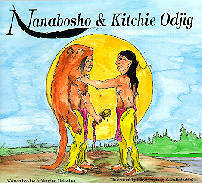 Nanabosho & Kitchie Odjig. With Matrine McLellan. Illustrated by Lloyd Swampy and Jeff Burling. Pemmican, 1997. Grades 2-4. 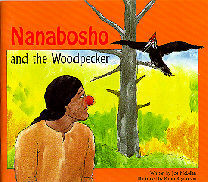 Nanabosho and the Woodpecker. Illustrated by Rhian Brynjolson. Pemmican, 1995. Grades 1-3. Nanabosho Dances. Illustrated by Rhian Brynjolson. Pemmican, 1991. Grades 2-5. 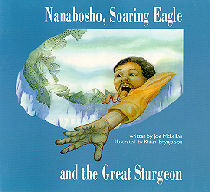 Nanabosho, Soaring Eagle and the Great Sturgeon. Illustrated by Rhian Brynjolson. Pemmican, 1993. Grades 2-6. 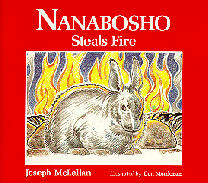 Nanabosho Steals Fire. Illustrated by Don Monkman. Pemmican, 1990. Grades 1-4. *This article is based on an interview conducted in Winnipeg, January 22, 1998.